Spun Stories has proven to be a huge success since its launch in 2015, with more than 90 stories shared at 15 sold out events. At the most recent instalment at Darwin Festival, Spun gave a little more insight into what goes on behind the scenes, shining a light on their producers. 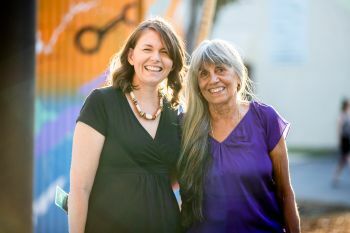 Off The Leash caught up with one of these producers, Kylie Stevenson, who was recently nominated for a Walkley Award for her podcast Lost In Larrimah, to tell us more about her process with Spun. Why did you want to get involved with Spun? I really loved going to the event as a spectator and I love storytelling. How do you know who has a good story? Everyone has a story. There are stories hidden all over Darwin – you never know who you’re talking to. There might be someone you say hi to at the shops and they may have the most extraordinary life story. It’s about finding those people and giving them the opportunity to tell their story. A lot of people think they’re not interesting and that is never the case. Everyone is interesting and has something in them. That’s the biggest barrier to someone telling a story – they say ‘I don’t have anything interesting to say’ but then say 15 interesting things. So what’s your interesting story? I spent a month in Zanzibar learning to speak Swahili. Can you still speak Swahili? Why do you think Spun has been so successful? People just love a good story. Finding time to read a story, or even listen to one on a podcast, is sometimes tricky, but if you have tickets to an event you make the time. There’s also something special about being able to see a person be vulnerable and put themselves out there. Can you give us a sneak peek at what can be expected at the next event? The theme is ‘rebellion’ and we’ve got a line up including a local legend, some rabble-rousers and those who buck the trends and pave the way for progress.